You probably will not be surprised to hear that I found Imanmade on Twitter. Iman has launched on Etsy where she sells handmade natural vegan body butters. Iman and her family suffer from eczema and allergies so she understands skin issues. "Imanmade Natural Skin Care products are free from unnecessary chemical nasties and artificial preservatives which can irritate delicate skin. Each item is handmade in the UK with loving care by myself, in small batches for freshness. All packaging used is recyclable but I also encourage customers to reuse jars if possible." I accepted an offer to review and was delighted when the parcel arrived. 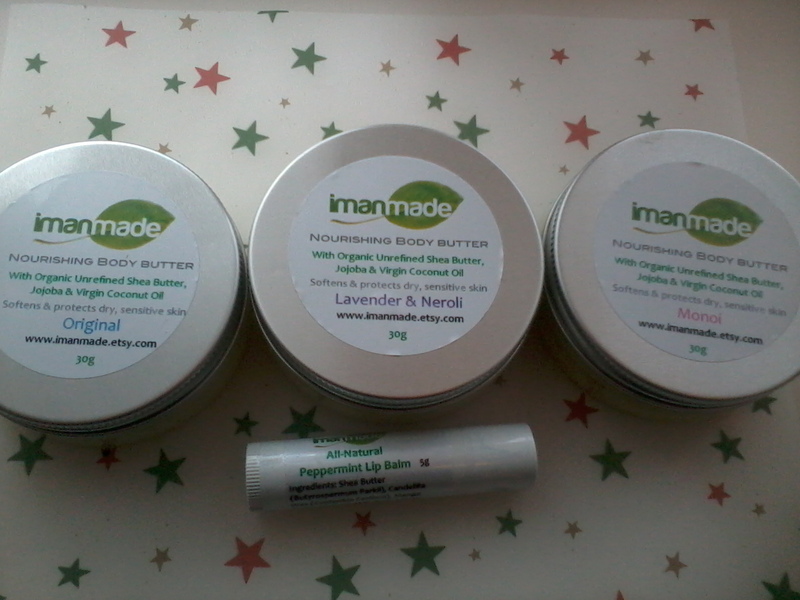 I received three body butters and a peppermint lip balm. 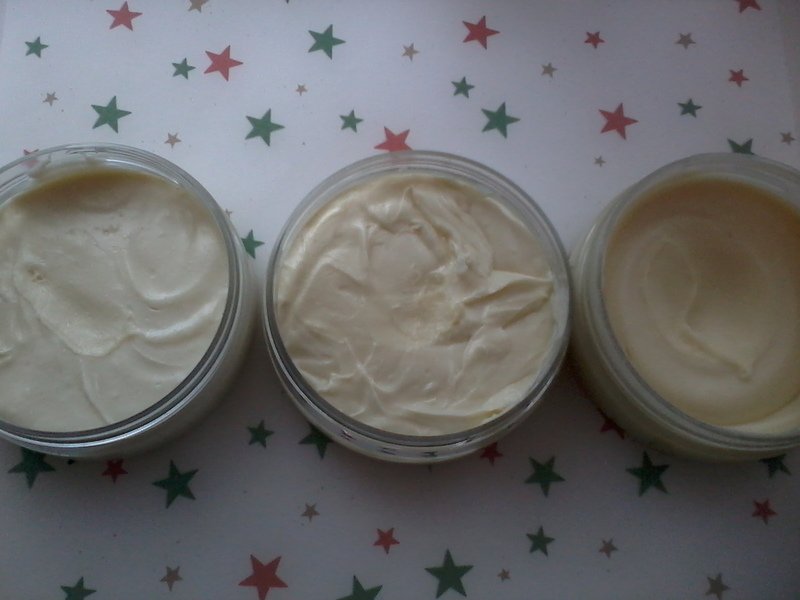 The body butters are available as Original (unscented), Lavender & Neroli and Monoi. The base ingredients for all three butters is the same - Raw Shea Butter, Virgin Coconut Oil, Extra Virgin Olive Oil, Sweet Almond oil, Jojoba oil, Vitamin E.
I like that Imanmade is offering an unscented version as this is helpful for those who can not tolerate essential oils. The Lavender & Neroli and Monoi de Tahiti Oil give the butters additional skin healing properties. Out of the two I am in love with Monoi. It is a tropical floral scent with a hint of coconut and I am always drawn to these types of fragrances. Monoi oil is an ancient Polynesian beauty secret. It is created by steeping native Tahitian gardenia flowers in coconut oil. The consistency of the three butters is very similar. They are soft, creamy and melt into an oil on the skin. They are rich with oils and a great way to treat dry skin. You do need to allow a few minutes for the butter to be absorbed into the skin so I prefer to use them after a shower at bedtime. I like using the body butter on my legs after shaving, it does not irritate my skin and appears to help combat the scaly dryness I often experience. Overall, as long as you like rich oils on your skin I can recommend these products. The individual body butters cost £7 for an 85g tub and if you can not decide a sample box is available for £10. Disclaimer - I was sent these products free of charge to review, all opinions are my own, I have not been paid to review or promote this company, none of the links are affiliated. It's good to see you back! This is a really good post, as usual! Very detailed and very honest. Could not ask for a better review! Thanks!